I do a lot of stuff in my mind. Like accomplishing way more tasks in a day than humanly possible. In my mind, every night I plan to get up early the next day to start conquering the to do list. The list is all checked off at the end of the day and I beam with satisfaction. I also exercise a lot (still in my mind). I envision myself running and sweating and feeling so accomplished by the fact I can actually run. It's like I'm running a 5K everyday. And I see my jeans slipping on and buttoning with ease because of all this running I'm doing. Since I'm exercising it's only natural that I'm also eating really really healthy (yet tasty) foods. Again, we are still in my mind. And I feel all energized and clean from eating such nutritionally rich super foods. I'm practically glowing from all this healthiness. And of course I still have time to check a few more things off my to do list before I turn in for the night. Then I get up and do it all over again. I'm sure you can guess where this is going. Reality. Why does reality always come along and ruin everything? In real life I'm lucky if I get through 1/3 of my to do list on most days. Even if I actually set my alarm to rise early and tackle a few more projects in my day...I pretty much always snooze. At least 3 times, sometimes more. And I rarely exercise. If I do, it certainly doesn't involve running. Best case scenario it involves a swift walk, occasionally up a hill if I'm feeling really adventurous. It's so much more fun to run in my head I guess! Food is the one area where sometimes I accomplish the lofty goals my mind has in store. I try to eat healthy-ish. But I also do more than my fair share of indulging in cookies, cakes, pies, ice cream....more cookies. Cookies live in my mind. And thankfully they are a pretty regular reality around here. They are my indulgence of choice. I'm always looking to try new cookie flavor combos. These cookies were completely experimental. I was looking for something different to send for Operation Baking GALS this month. I was very happy with the finished product and hope they made it through 7 days of travel overseas. I took a white chocolate chip macadamia nut recipe and pretty much went to town. It started with plump dried blueberries (I'm pretty certain blueberries are a super food! Right? Right??) and almonds (good for you too! ), along with butter and plenty of brown sugar. Okay, those last two are questionable in the health department, but they make these oh so chewy and caramelly delicious. Don't forget about the sweet, creamy, white chocolate chips. 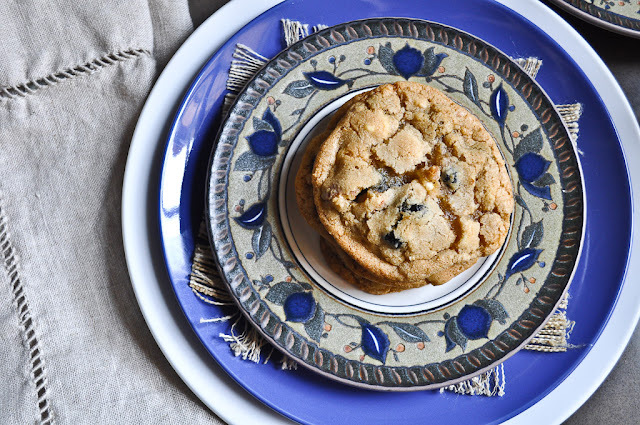 All the flavors work really well together...blueberry pie, meets cheesecake, meets cookie. Good stuff. I better go back to exercising in my head. Preheat oven to 375 and line 3 baking sheets with parchment paper. In a medium whisk flour, baking soda and salt. In the bowl of a stand mixer fitted with the paddle attachment (you can also use a hand mixer) cream butter and sugars on medium speed until pale and fluffy, about 2 minutes. Turn mixer to low and add eggs one at time, until incorporated. Mix in vanilla. Add in flour mixture in three batches and mix on low until just incorporated. 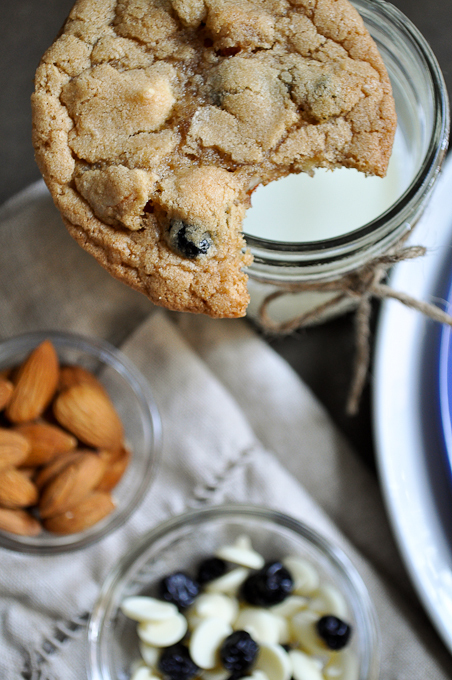 Add white chocolate chips, blueberries and almonds and mix on low until evenly distributed. Using a medium cookie scoop (about 2 tablespoons) scoop out 12 cookies per baking sheet. Bake for 11-13 minutes until lightly golden brown, rotating sheets from front to back and top to bottom halfway through cooking. Allow to cool on baking sheet for 5 minutes and transfer to a wire rack to cool completely. What a unique combination. They look fabulous. Your cookies look so perfect!! I always want that kind of texture, chewy and gooey... Next time I make cookies, I'll try your recipe! These cookies look awesome, I love the dried blueberries in them, especially with the white chocolate! Wonderful wonderful combination of flavors! I LOVE these cookies!